George Davis IV and Chandler Hoffman scored late on a night the boys in purple took 33 shots. 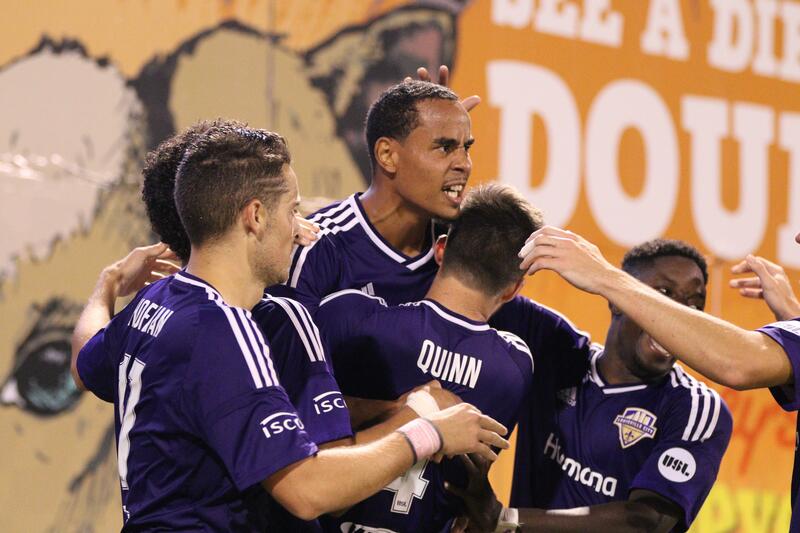 It was a case of new year, same result for Louisville City FC in Sunday's home USL playoff game at Slugger Field. Celebration rang out in the club's supporters section, but only after 90-plus minutes of regulation soccer. Finally, LouCity broke through, scoring in overtime to defeat the Richmond Kickers 2-0 and advance to the USL's Eastern Conference Semifinals. The club next hosts the Charleston Battery at 7:30 p.m. Saturday. A year ago, LouCity scored twice in overtime to beat the Battery in the postseason as well. The latest playoff victory came with help. Midfielder Magnus Rasmussen absorbed a kick to the chest in the fourth minute Sunday, resulting in an early, straight red card to Richmond's Samuel Asante. From there, the visiting Kickers played down a man. LouCity tallied a season-high 33 shots. Twelve of them came in overtime, including the goals. First, Aodhan Quinn fed a pass into Davis IV, and the veteran finished to the right of Richmond keeper Andrew Dykstra in the 92nd minute. Later, in the 102nd minute, Kadeem Dacres played a ball through to Chandler Hoffman, and the striker ended a 12-game scoring drought by hitting the back of the net from a tough angle. Dykstra was otherwise phenomenal, recording 10 saves in more than 120 minutes on the pitch. The Kickers packed in their defense while down a man, surviving the length of a regular-season game with a clean sheet. In the playoffs, of course, there has to be a winner. "I thought tonight, Richmond made it really difficult for us to play," said LouCity coach James O'Connor. "That long, with 10 men, and defend the way they did, I think they deserve an honest credit. "...The guys kept battling away, and we kept knocking on the door, and we knocked it in eventually." In a game that kicked off three hours before LouCity on Sunday, the No. 6 seed Battery upset No. 3 FC Cincinnati in front of more than 30,000 fans at Nippert Stadium. The top-seeded New York Red Bulls II and No. 4 Rochester Rhinos also advanced through to the next round. LouCity played a particularly chippy opening-round game. After assessed their red card, the Kickers went on to tally four more cards in the first half, all yellows. Looking for more striking power, O'Connor made a key move to substitute Hoffman for Rasmussen in the 33rd minute. Not long after, Aodhan Quinn put a free kick on frame, but teams went into the locker room scoreless. Out of the half, starting forward Cameron Lancaster booted a shot on goal, and Dacres followed with a rocket that sailed just wide. In the 65th minute, Kickers midfielder Yudai Imura stepped up to head away one of the few balls Dykstra wasn't there to clean up. And in the 73rd minute, Ilija Ilic took a stab at breaking up the stalemate not long after brought in the game. Two minutes into overtime, the smoke poured. LouCity buried a shot to defeat the Kickers, who also suffered a 2-0 defeat at Slugger on Sept. 10 with the regular season winding down. “When they went down a man," Davis IV said, "sometimes you think maybe it’s a little added pressure now that we feel like we have an advantage, and you feel like you have to capitalize right at the moment. Louisville City FC: 13-Greg Ranjitsingh, 24-Kyle Smith, 15-Sean Reynolds, 18-Paco Craig, 6-Tarek Morad (77' 2-Ben Newnam), 8-Guy Abend, 4-Aodhan Quinn, 7-Kadeem Dacres (107' 77-Andrew Lubahn), 10-Magnus Rasmussen (33' 17-Chandler Hoffman), 12-Mark-Anthony Kaye (62' 22-George Davis IV), 9-Cameron Lancaster (69' 14-Ilija Ilic). Subs not used: 28-Tim Dobrowolski, 36-Paolo DelPiccolo. Richmond Kickers: 50-Andrew Dykstra, 2-William Yomby, 8-Hugh Roberts, 32-Scott Thomsen, 18-Alex Lee (116' 29-Conor Shanosky), 31-Braeden Troyer, 4-Fred Owusu Sekyere (67' 14-Yudai Imura), 28-Samuel Asante, 22-Brian Ownsby (65' 26-Miguel Aguilar, 85' 24-Jackson Eskay), 17-Jason Yeisley, 9-Anthony Grant (81' 7-Matthew Delicate). Subs not used: 46-Mark Nankervis, 10-Sunny Jane.